This new 1/72 Sherman III includes a number of completely new parts in keeping with the Sherman III variant, items such as a three-piece transmission cover, sand shield, upper and lower hull. Photo-etched parts are also present, which allow the accurate replication of parts like storage racks that was common in Commonwealth tanks operating in the North African and Mediterranean campaigns. 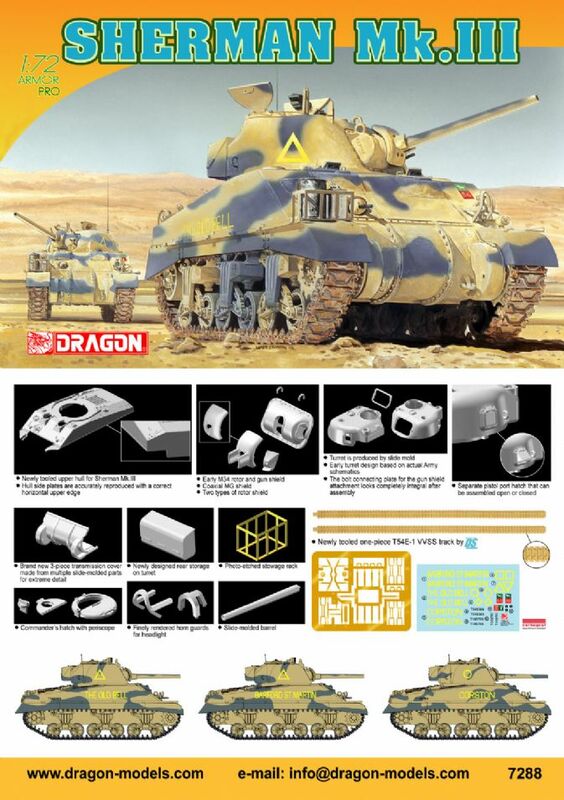 For all those who love Shermans, and for those yearning to have a Sherman Mk.III, then this kit will be an instant hit! A Sherman III, which is the British nomenclature for the M4A2 model fitted with a 75mm gun. This vehicle fought in theaters such as North Africa and Italy, and is a valuable addition to the fleet of Shermans that is already available from Dragon in 1/72 range.